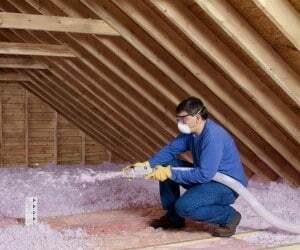 Insulation Contractor Insurance Oregon. Whether you own a small business that installs insulation for residential properties, you own a large company that insulates commercial buildings, or you run a retail store that where your clients pick out the insulation products that they want - or you do all three - the services you provide for your clients are extremely important. OR insulation contractors install materials in new and existing structures to reduce or prevent the leakage or transfer of heat, electricity, or sound outside its intended area. Insulation may be done to conserve energy, to add sound - or noise-proof materials, or to add fire proofing to structures. Insulating materials may consist of batting, rolls or rigid materials that are installed in spaces between interior and exterior walls, foundations or ceilings. Your customers look to you to ensure that their OR properties are properly insulated so that they can better manage their heating and cooling costs; you are also expected to complete the services that you provide in a timely manner and on- or under-budget. Of course, you are also expected to get the job done without any issues. But despite all of your best efforts, issues can arise. That's why it's so important for insulation contractors to invest in the right type of insulation contractor insurance Oregon. Insulation contractor insurance Oregon protects your business from lawsuits with rates as low as $47/mo. Get a fast quote and your certificate of insurance now. But, with the right insulation contractor insurance Oregon protection, you can avoid financial turmoil because instead of paying these expenses yourself, your insurance carrier will cover them for you. In other words, OR insulation contractors need to carry insurance in order to avoid serious losses that could potentially bankrupt their business. Request a free Insulation Contractor Insurance Oregon quote in Albany, Ashland, Astoria, Aumsville, Baker, Bandon, Beaverton, Bend, Boardman, Brookings, Burns, Canby, Carlton, Central Point, Coos Bay, Coquille, Cornelius, Corvallis, Cottage Grove, Creswell, Dallas, Damascus, Dayton, Dundee, Eagle Point, Estacada, Eugene, Fairview, Florence, Forest Grove, Gervais, Gladstone, Gold Beach, Grants Pass, Gresham, Happy Valley, Harrisburg, Hermiston, Hillsboro, Hood River, Hubbard, Independence, Jacksonville, Jefferson, Junction, Keizer, King, Klamath Falls, La Grande, Lafayette, Lake Oswego, Lakeview town, Lebanon, Lincoln, Madras, McMinnville, Medford, Milton-Freewater, Milwaukie, Molalla, Monmouth, Mount Angel, Myrtle Creek, Myrtle Point, Newberg, Newport, North Bend, Nyssa, Oakridge, Ontario, Oregon, Pendleton, Philomath, Phoenix, Portland, Prineville, Redmond, Reedsport, Rogue River, Roseburg, Salem, Sandy, Scappoose, Seaside, Shady Cove, Sheridan, Sherwood, Silverton, Sisters, Springfield, St. Helens, Stanfield, Stayton, Sublimity, Sutherlin, Sweet Home, Talent, The Dalles, Tigard, Tillamook, Toledo, Troutdale, Tualatin, Umatilla, Union, Veneta, Vernonia, Waldport, Warrenton, West Linn, Willamina, Wilsonville, Winston, Wood Village, Woodburn and all other cities in OR - The Beaver State.